Ever had that problem of not being able to find your makeup easily? Well then we have the ultimate solution for you! 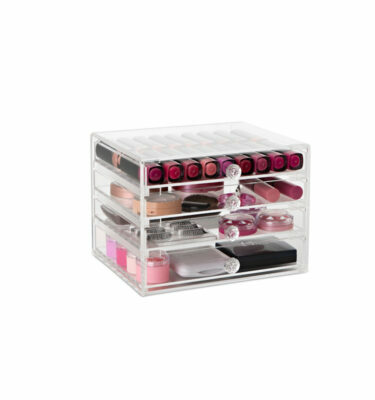 Our 5 drawer Original Makeup Organiser is perfect to store your makeup, makeup tools, hair accessories or even jewellery. 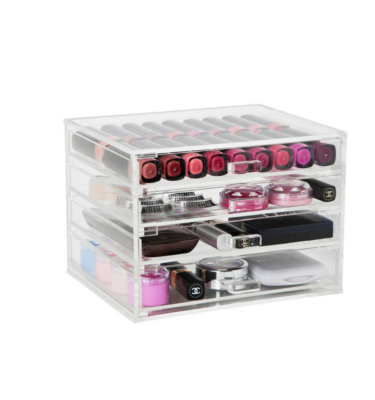 Perfect for organising all of your makeup so that you can find it easily and effortlessly. 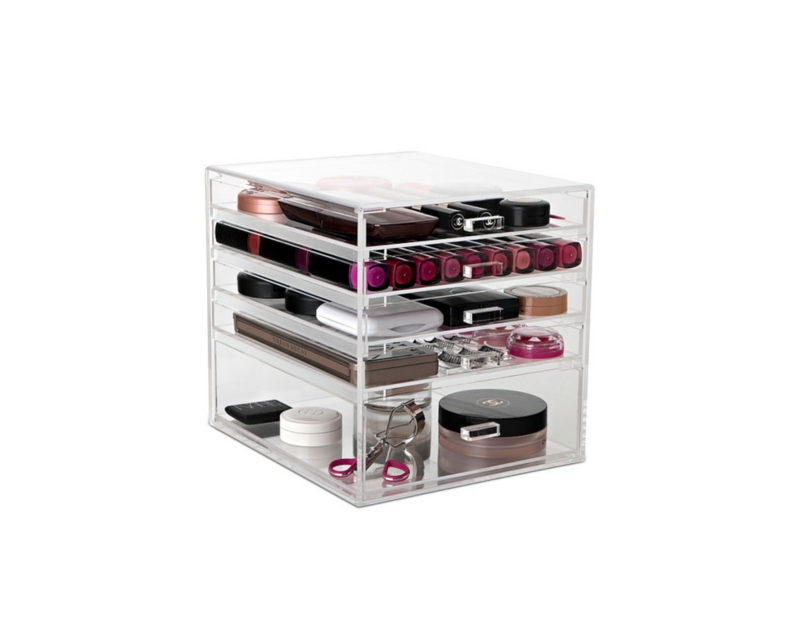 The sleek modern design of our Original Makeup Box has five drawers is made from thick, clear high quality acrylic. The Original Makeup Box is the perfect gift for that special someone or for the girl who has everything! Exceptionally priced at $118 including delivery within Australia. 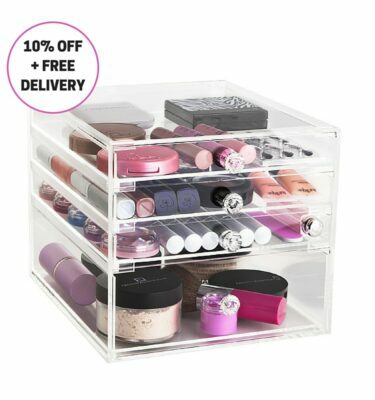 For an extra $18 you can add our Brush Holder which is a great complimentary piece and is an affordable solution to organise your makeup brushes keeping them safe and neatly displayed. I bought this for my sister last Christmas to coinside with her ‘organised life’ New Year resolution. When it arrived (on time, yay!) I deliberated for days trying to decide if I should keep it for myself or give it to her. I decided to give it to her. Biggest girl regret ever!!! I am envious every time I see it in her bathroom, all of her makeup sitting so pretty in this elegant, sophisticated & glamorous box! There is no compromise on quality & I bet she feels just like a Kardashian every morning. Absolutely love it! One of the best things I have ever invested in. I love the design, the amount the box can actually hold is amazing. The fact it’s see through is a huge thing for me. 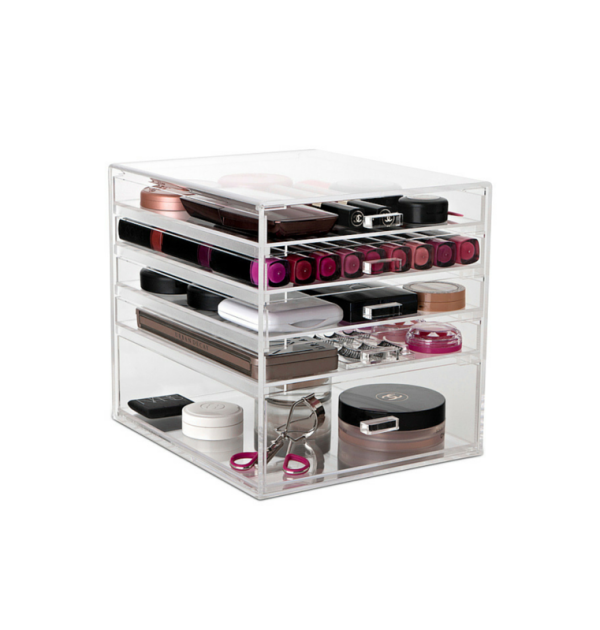 I’ve owned my box for several years now and could honestly say that it was the best thing I ever purchased when it came to storing my make up products. Thank you Make Up Box Shop! I’ve had this baby for three and a half years and could not imagine getting ready without it. 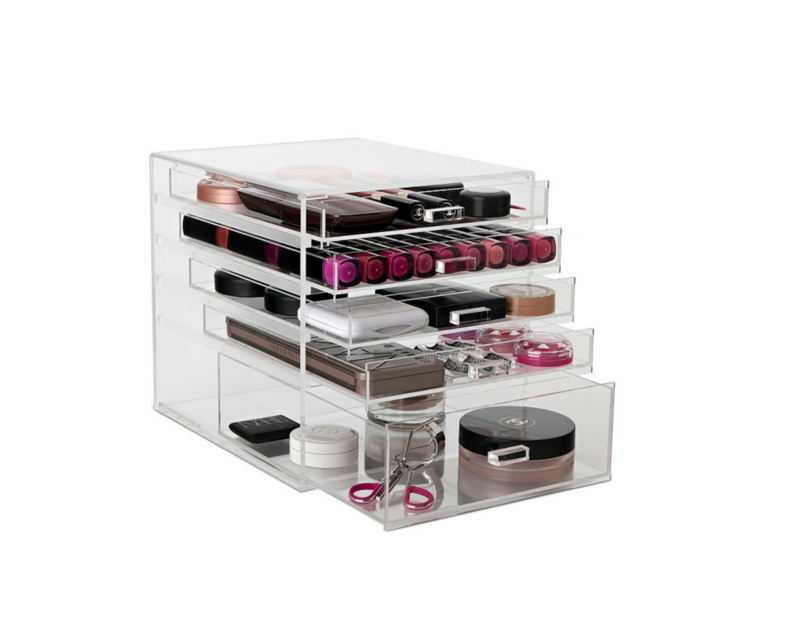 The contemporary acrylic design certainly has a luxe, glamorous feel about it (a la Kardashian) and I’ve always received compliments from visitors who have never quite been able to resist pulling out the cube’s beautiful little drawers to have a peruse through my makeup collection. It has proven durable over the years and has been able to house an abundance of product. I really miss it when I’m travelling – the time it takes to get my makeup done is depressingly long when I have to waste time trying to dig through product inside a dark, disorganised bag. The Original Makeup Box is truly a time-saving miracle and a definite must have for any makeup collection. I have had this for a while now. The best thing I have bought to store my makeup. Love it. Love the products at the Make Up Box Shop. 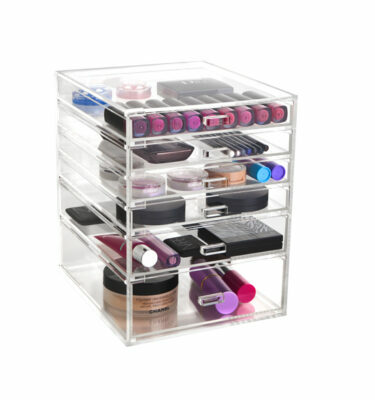 I cannot recommend this acrylic unit or company highly enough! I went to place my order just as the sale was finishing so The Make Up Box Shop extended the sale price for me by 24hrs. I then ordered and had such great customer service throughout the entirety of my transaction. I ordered three of these same units and they arrived today. Two were perfect and one had a tiny chip and tiny crack on the bottom draw. I emailed them a few minutes after noticing the damage and they’ve already organised for a replacement draw to be sent out tomorrow! I’m literally so blown away! These were so well packaged that I’m surprised one was damaged at all, yet the company was so helpful in resolving the whole thing (even though it was probably the posties fault). I’m in love already! I’ve already covered my Facebook page and Instagram with photos so feel free to check them out (IG-@daniellegoodall). Quality product. So happy with my purchase. Can hold so much and it great to look at.